The birth of a single mutant child forever changed the landscape of the X-Universe. 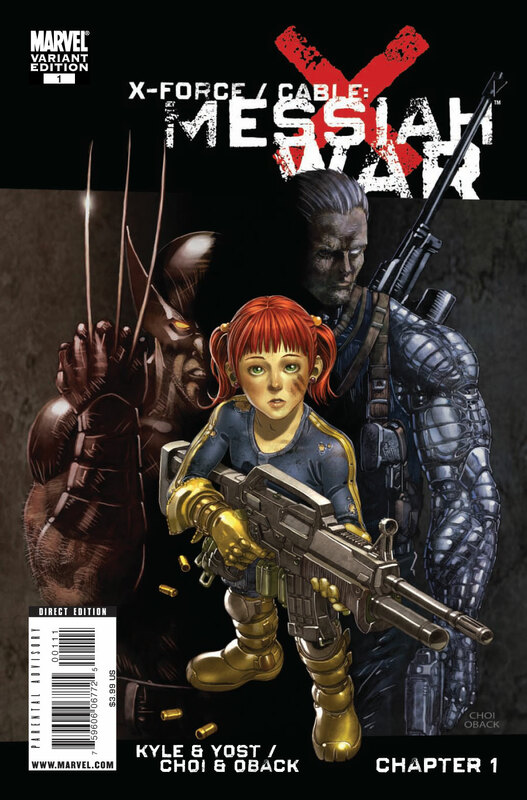 Some see the baby as the last hope for mutankind’s survival; others see it as the bringer of the Apocalypse… No one knows which side is right because Cyclops handed the newborn over to Cable, believing his son could save both the child and mutantkind. But Cable never came back. Now, months later, Cyclops has found his son hiding in the FUTURE… and he’s sending in the one team that will do what needs to be done in order to ensure the survival of their species… X-FORCE. The X-Men event of the decade, “MESSIAH COMPLEX,” continues here as the past, present and future converge in the pages of X-FORCE and CABLE. Continues next month in the pages of CABLE #13 and X-FORCE #14! 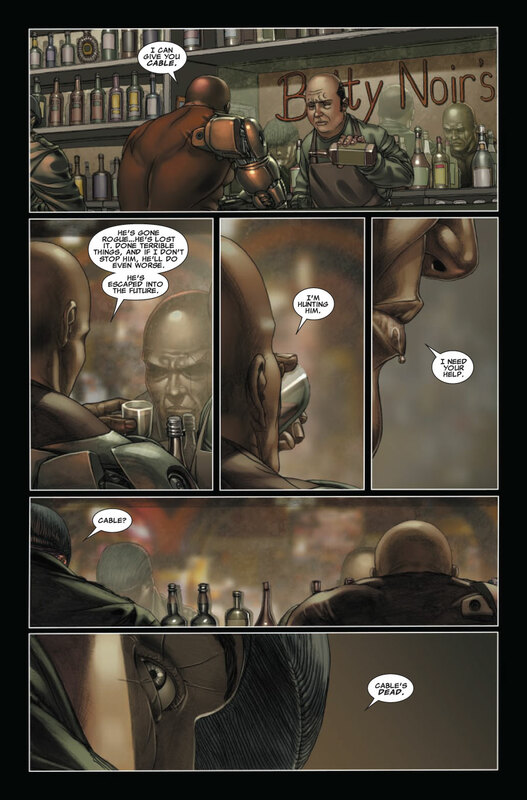 In a bar Bishop approaches Stryfe for aid in killing Cable and Hope by giving him Apocalypse. 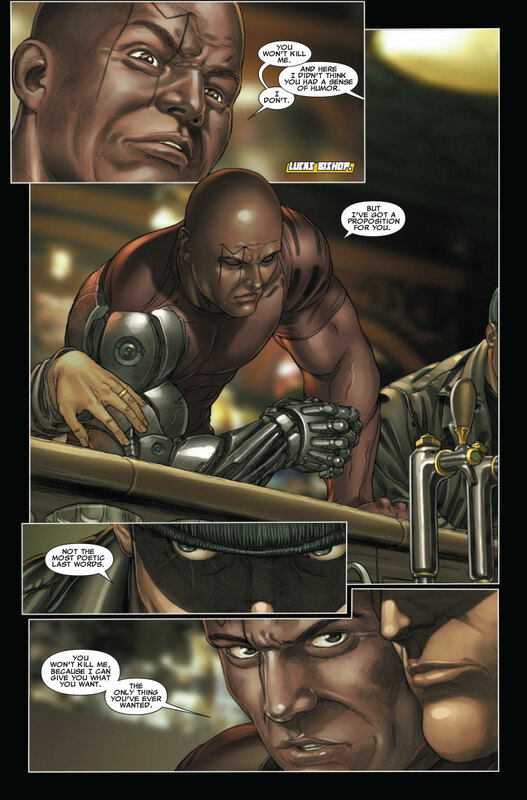 Art- One of my very favorite artists turns in great work for this introductory war between Bishop and his former teammates. Tension- Cyclops is literally the king and genera of the mutant race here trying desperately to bring his people from the brink of extinction. The scene between himself and Beast are great, underlying the problems their friendship would later undergo. Humor- Deadool’s inclusion is guaranteed to induce a chuckle. Craig and Kyle- Two of my favorite young writers and they deliver their usual somber toned story with great dialogue. The pacing of the story also picked u in the latter part of the book which added to the overall mood. Villainy- This series is where Bishop moves from being perhaps misunderstood to full on full throttle villain. He kills potentially millions if not billions in the future between 2272 and 2753. Genocide is too good a word for he actually does. It’s tragic just how far he’s fallen because of his beliefs. RIP Bishop you were the first black X-man too bad the writers have made you just another black supervilain.